The Scott Polar Research Institute part of the University of Cambridge was founded as a lasting memorial to Scott and his companions. Scott was born on 6 June 1868 at Outlands, Devonport, the third child of Hannah and John Scott, a brewer, and descendant of three generations of sailors. He was sent to Stubbington House, Fareham, Hampshire to be coached for a cadetship in the Royal Navy and joined the training ship HMS Britannia at the age of thirteen. Between 1883 and 1887, he served as midshipman on four vessels, HMS Boadicea, HMS Liberty, HMS Monarch and HMS Rover, meeting Clements Markham, Secretary of the Royal Geographical Society, for the first time on HMS Rover. Scott spent the winter of 1887 to 1888 at the Royal Naval College in Greenwich, passing his examination for the rank of lieutenancy in 1888. He was commissioned as a sub-lieutenant and instructed to join the cruiser HMS Amphion, stationed in the Pacific. His service in the Pacific was followed by a brief spell in the Mediterranean in HMS Caroline and in September 1891, he reported on board the torpedo training ship, HMS Vernon, at Portsmouth for a two year course. He emerged with first-class certificates in all subjects and was appointed to HMS Vulcan, an experimental torpedo depot-ship stationed in the Mediterranean. The next few years were clouded by family troubles. Scott’s father had sold the brewery, living on the proceeds of the sale until the family was reduced to poverty, declaring bankruptcy in 1894. Scott applied for a transfer to HMS Defiance, a torpedo training ship stationed at Devonport, in order to help arrange the lease of the family home, Outlands. Following this he was then appointed torpedo lieutenant in HMS Empress of India. In the summer of 1897, Scott was appointed torpedo lieutenant to HMS Majestic and in the same year, his father died, leaving his mother, almost penniless. Scott contributed to the support of his mother and his sisters, and after the death of his brother Archie in 1899, he became completely responsible for his family’s welfare. In June 1899, while serving on HMS Majestic, Clements Markham told him of a proposed British Antarctic expedition and within two days, Scott had applied to command the expedition. In June 1900, Scott was appointed to lead the British National Antarctic Expedition, 1901-1904, and later in the same month was appointed to the rank of commander. Recruiting a company of Royal Navy and Merchant Navy seamen aboard the purpose-built expedition ship Discovery, and with a strong scientific team, the expedition sailed from Lyttleton, New Zealand on 21 December 1901, wintering at Hut Point, Ross Island. Scott led the first major sledging expedition, accompanied by Dr Edward Wilson and Ernest Shackleton, setting out in November 1902 to explore inland across the Ross Ice Shelf toward the South Pole. On 30 December 1902, they reached 82º17’S, their farthest south. In October 1903, Scott led a nine-man party westward to explore further the routes in the western mountains. Along with Edgar Evans and William Lashley, Scott climbed a staircase of glaciers to stand for the first time on the polar plateau. They then marched many miles across the bleak plain, turning back on 30 November, and returning to Discovery just in time to celebrate Christmas 1903. Having remained ice-bound in McMurdo Sound since 1902, Discovery was eventually freed from the ice in February 1904, after the arrival of the relief ships Morning and Terra Nova. The expedition was highly successful, having made the first extensive exploration on land in Antarctica and producing many volumes of scientific results. On his return, Scott was promoted to captain, decorated, and wrote a book on the expedition, ‘The voyage of the Discovery’. This was followed by postings to HMS Victorious in 1906, HMS Albemarle in 1907 and HMS Essex in 1908. Later in 1908, he was appointed commander of HMS Bulwark and in September. Also in 1908 Scott married Kathleen Bruce, a talented sculptor, their son Peter Markham Scott was born in 1909. 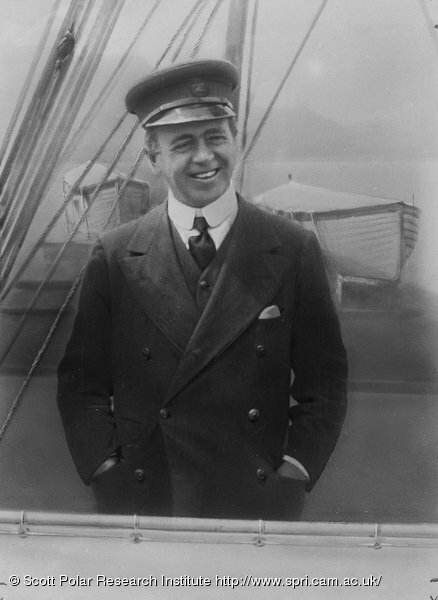 Scott was appointed Naval Assistant to the Admiralty in 1909, but was motivated to plan an expedition to the South Pole by the success of the British Antarctic Expedition, 1907 – 1909 (leader Ernest Shackleton). Shackleton had located the Pole on the featureless high ice plateau, and had come within 97 nautical miles of it. Scott returned to the Antarctic with the British Antarctic Expedition, 1910 – 1913, wintering at Cape Evans on Ross Island. He led a strong scientific team, both naval and civilian, that included several companions from his previous expedition. Aware of the rival bid of Roald Amundsen, who was equipped with excellent dog teams, Scott started out for the Pole in late October 1911. With the aid of experimental motor tractors, dog teams and ponies, he followed his previous route across the Ross Ice Shelf before resorting to man-hauling up the Beardmore Glacier in Shackleton’s footsteps. A five-man polar party successfully traversed the plateau, reaching the Pole on 17 January 1912, to find that Amundsen had reached the South Pole on 14 December 1911. On the return journey, the weakened party faced exceptionally unfavourable weather and sledging conditions. Edgar Evans was the first to die, near the foot of the Beardmore glacier. Lawrence Oates followed on 16 March, when he famously left the tent in a blizzard for the good of the party. Scott himself died with Henry Bowers and Edward Wilson in late March 1912, laid up by a blizzard 11 miles short of One Ton Depot, he was 44 years old. Whilst they were laid up in their tent Scott kept a journal and wrote 12 letters to friends, family and next of kin and left a message for the public explaining what he thought were the reasons why they did not reach the pole. The Scott Polar Research Institute was founded as a lasting memorial to Scott’s memory. The Diaries of Captain Robert Scott, a Record of the Second Antarctic Expedition, 1910 – 1912. (1968) Vols.1-6. Tylers Green University Microfilms. Scott, R.F. (1913) The Voyage of the Discovery. London: John Murray London. Reprinted: Nonsuch Publishing 2005. Scott, R.F (1913) Journals: Captain Scott’s Last Expedition. London: Smith, Elder & Co. Reprinted, Oxford: Oxford University Press, 2008. Stonehouse, B.J ed (2002) Encyclopaedia of Antarctica and the Southern Ocean. Chichester: John Wiley & Sons. Crane. D. (2005) Scott of the Antarctic. Harper Perennial. Pound R. (1966) Scott of the Antarctic. London:World Books. Huxley, E. (1977) Scott of the Antarctic. Reprinted: London: Pan Books 1995. The Scott’s last expedition Twitter page is linked with the Last Expedition blog on the Scott Polar Research Institute website. The blog follows Scott’s expedition day by day through his diary entries from the British Antarctic (Terra Nova) Expedition 1910-1912. This entry was posted on Friday, November 7th, 2008 at 11:30 am	and is filed under Biographies, Resources, Scott Captain Robert Falcon. You can follow any responses to this entry through the RSS 2.0 feed. Both comments and pings are currently closed.